The online shopping cart is a metaphor that provides customers with a means to visualize and understand the highly technical operation of ecommerce without having to learn a lot of new terms. It helps shopping online to be very similar to shopping at a storefront in some respects and shopping through a mail-order catalog in others, easing the transition for customers who are using ecommerce for the first time. Especially because in order to make purchases online, customers often share their very valuable credit card information, the familiarity that the shopping cart metaphor offers is important in helping them feel safe with online transactions. The familiarity with the physical shopping cart process, not just the item, is key, because online shopping carts bear no tangible relationship to the metal object with swivel wheels in front, straight wheels in back, a seat for children, and a large basket for merchandise. The first part of the process, setting up an account at an ecommerce establishment, is similar to filling in a form in a mail order catalog. The customer supplies his or her name, address, card type, card number, expiration date, phone number, email address, and ship to address. Just as a mail order company that you establish an account with will provide you with a pre-printed order form for future purchases, so an ecommerce business will recognize returning customers who make subsequent purchases. The rest of the process is more similar to storefront shopping than mail-order, whence the shopping cart metaphor. The customer selects merchandise. At the storefront, they pick it up and physically place it in their cart, where they can see it; on the web, they click on it to select it and place it in their virtual shopping cart. Whereas the customer in a physical store builds a number of choices – size, color, quantity, and style, for example – into the act of placing the item in the cart, online, the customer may have to do this with separate steps, clicking on each selection individually. At any time, the customer can remove merchandise from the cart. At the retail store, they simply pick it up and place it back on the rack; online, they can change the quantity to zero or click a delete button, depending on the ecommerce shopping cart being used. When the customer has finished selecting merchandise, he or she heads to the checkout counter or cashier. In a retail store, the merchandise is removed from the cart and—in most stores these days—scanned, one by one; online, they are processed instantaneously. For extra charges—tax in storefronts and tax, shipping, and handling online—the processes are slightly different. When the total charge is determined, the customer submits payment. If in person, the customer hands the cashier his or her credit card, a check, cash, a gift certificate, etc. ; if online, the customer selects the payment instrument he or she wishes to use, whether a credit card, a gift certificate, or a PayPal account, for example. In each case when a credit card is tendered, the verification process is triggered and the purchase is either approved or disallowed, and if the latter, another form of payment is offered. The customer receives the items purchased. At a storefront, this usually means walking out the door with them, though it is not uncommon to purchase items and have them delivered, especially if the purchases are furniture or other large items; online, purchases are most often delivered through a delivery service, but occasionally downloaded. For shipping from a storefront, follow-up—such as arranging an exact delivery time and date—is often done by phone. For ecommerce, notifications about delivery and other communications are most often handled via email, which is used to a) confirm the order; b) confirm that the order was shipped out; and c) provide tracking information for the customer to follow the shipment progress. One key difference between the storefront shopping cart and the online shopping cart is the extent their relationship to the store as a whole. The physical shopping cart is a tool for a shopper. If they all went missing one day, the store owner could substitute baskets, paper bags, or little red wagons, and go order more that were identical or different, and only a small disruption in shopping would occur. For the online store, the shopping cart is a more critical asset. 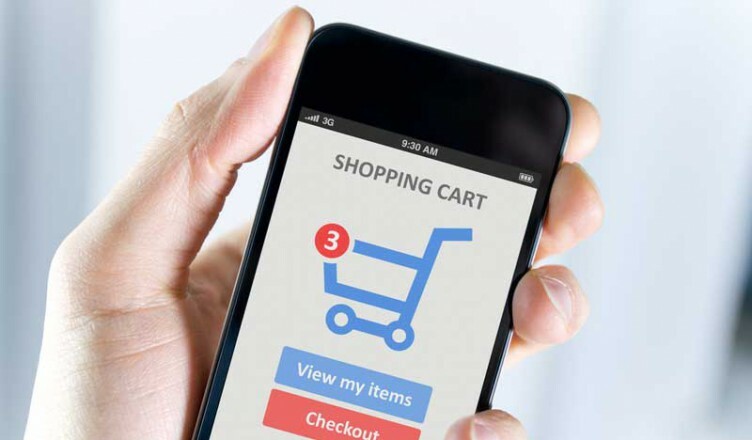 What is called the shopping cart software may actually provide not only the mechanism for customers to select and pay for merchandise but also the entire set-up for the online establishment. The failure of the shopping cart for the ecommerce business person is catastrophic, rendering the store unreachable to customers.